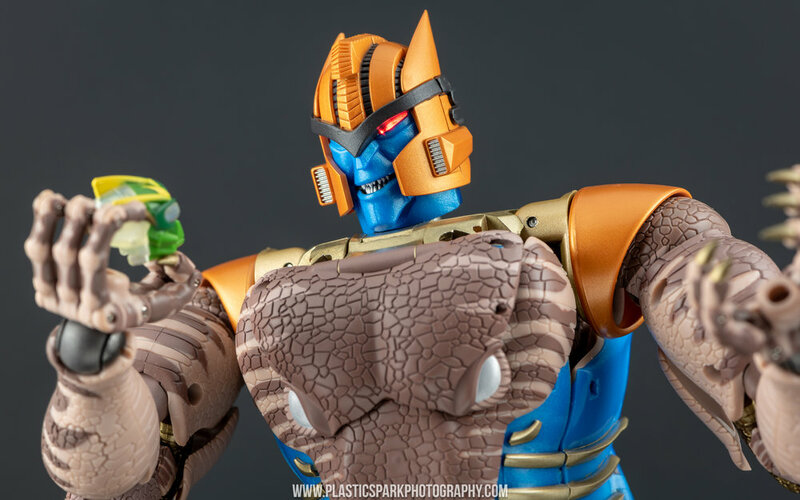 Takara has kept the momentum going in the Masterpiece Beast Wars line, releasing what is likely for many fans the most desired character from the series, the former Predacon turned Maximal; Dinobot. 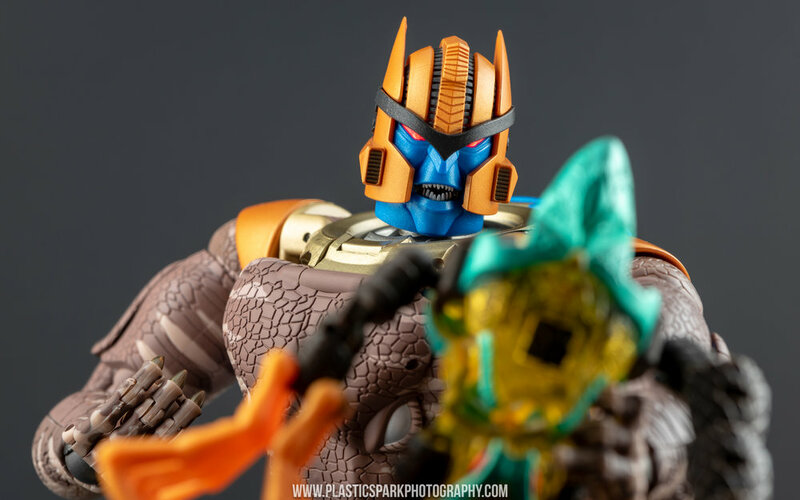 Dinobot was an incredible character who underwent massive personal development within the Beast Wars storyline (arguably more than any other character in the series) and became a fan favorite long before his most defining moments in the episode “Code of Hero”. 90's design aesthetics for the win! 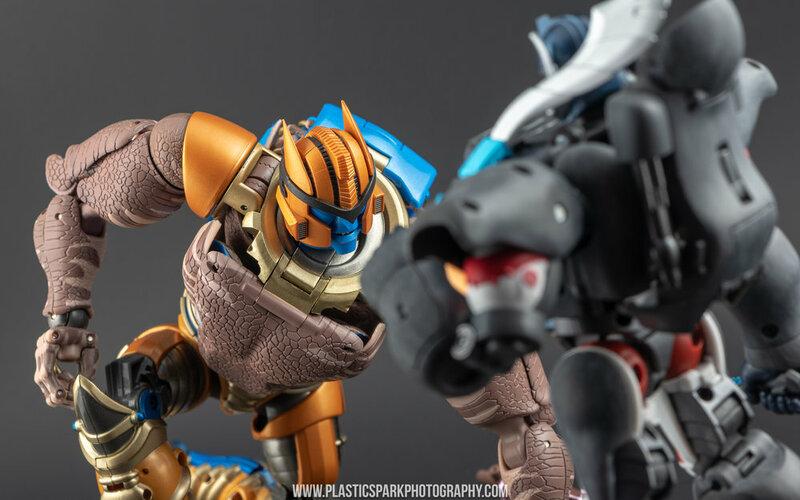 Whether it was quibbling with Rattrap, or fighting over command of the Maximal base with Optimus Primal, Dinobot was always the most fascinating character in any episode he featured in. He had a killer design coupled with an awesome array of weaponry. 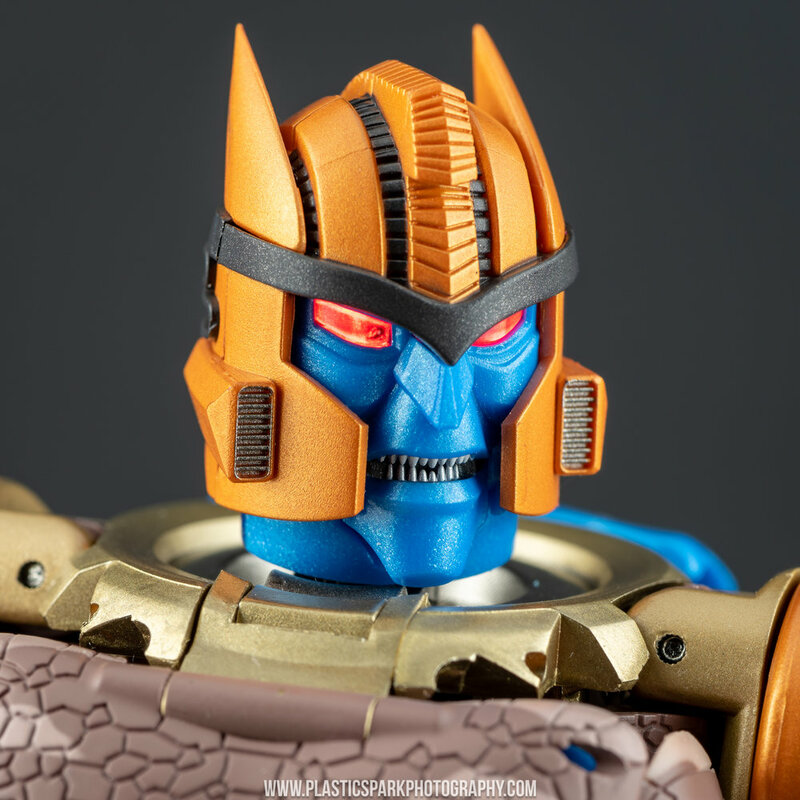 Add to that his unique snarling voice provided by the immensely talented Scott McNeil, and a penchant for Shakespearean monologuing when left to his own devices and you’ll see why Dinobot embedded himself in the minds of an entire generation of Transformers fans. "Take your stinking paws off me you damn dirty ape!" Despite his incredible presence, he’d never really been truly represented in toy form to my own personal satisfaction. The original Beast Wars figure was quite fun for the era in which it was released, and the Universe/Henkei mould is still an incredible piece of engineering despite it’s rather short stature and neutered weaponry. Despite their efforts, neither figure ever scratched the deep underlying collector’s itch (gross!) that was Dinobot. 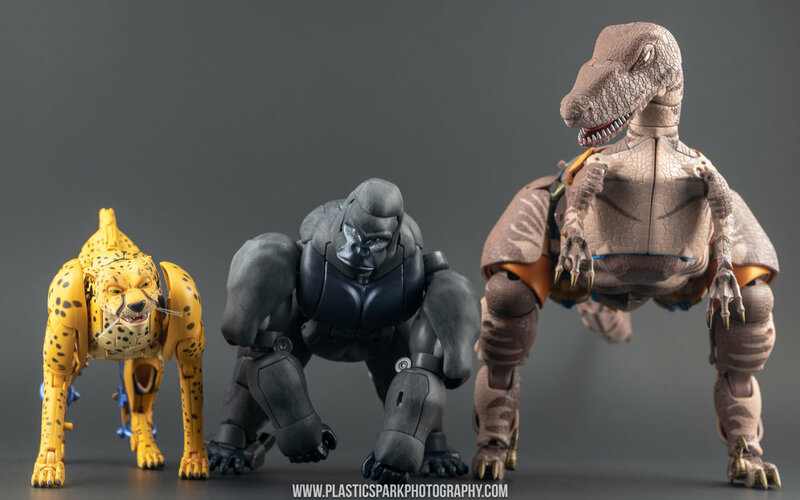 Fast forward a few years to the reveal of Masterpiece Optimus Primal. I’m staring slack-jawed at my monitor in disbelief. Masterpiece Beast Wars!? My mind raced to the possibilities. Surely they will just make Primal? Maybe a matching Megatron? Do I dare hold out hope that they might ever get to my personal favorites; Dinobot and Terrorsaur? 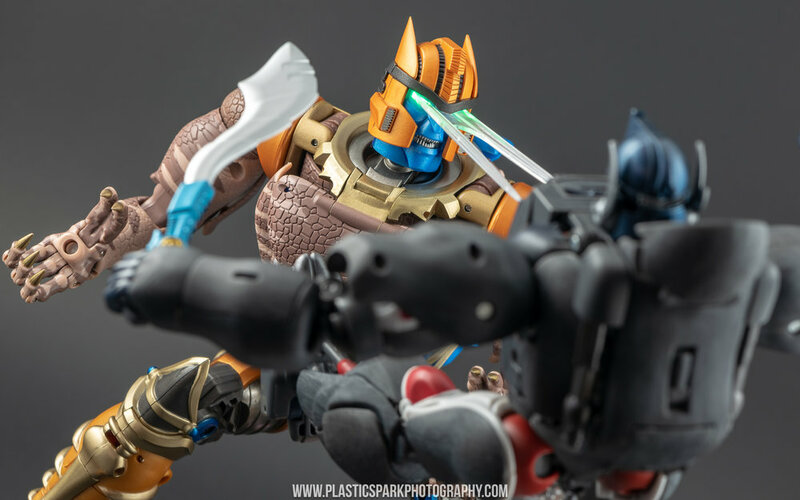 These were the musings of a fool, or so I thought, and brushed them aside, happy in my anticipation of Masterpiece Optimus Primal (who turned out to be one of my absolute favorite experiences in all my lifetime of toy collecting.) But then it didn’t stop! A new announcement! Masterpiece Cheetor! He looked incredible! 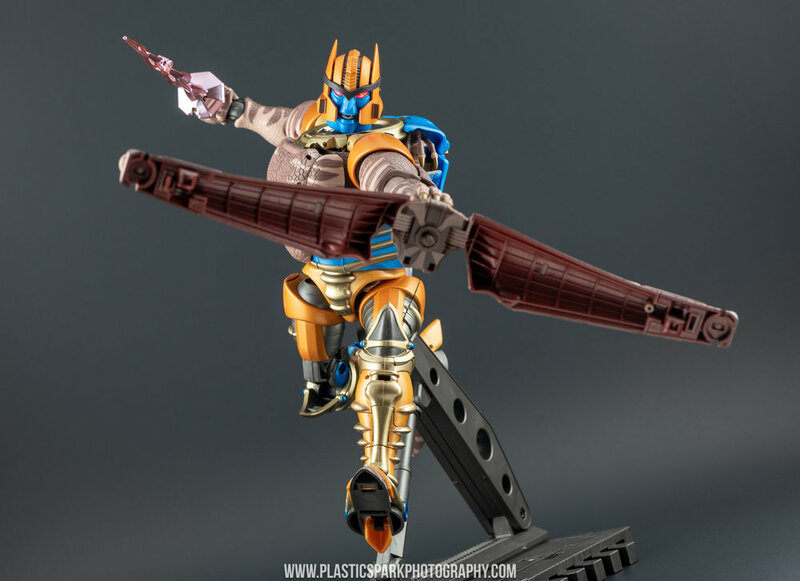 Sweet Primus those madmen at Takara are really doing it! 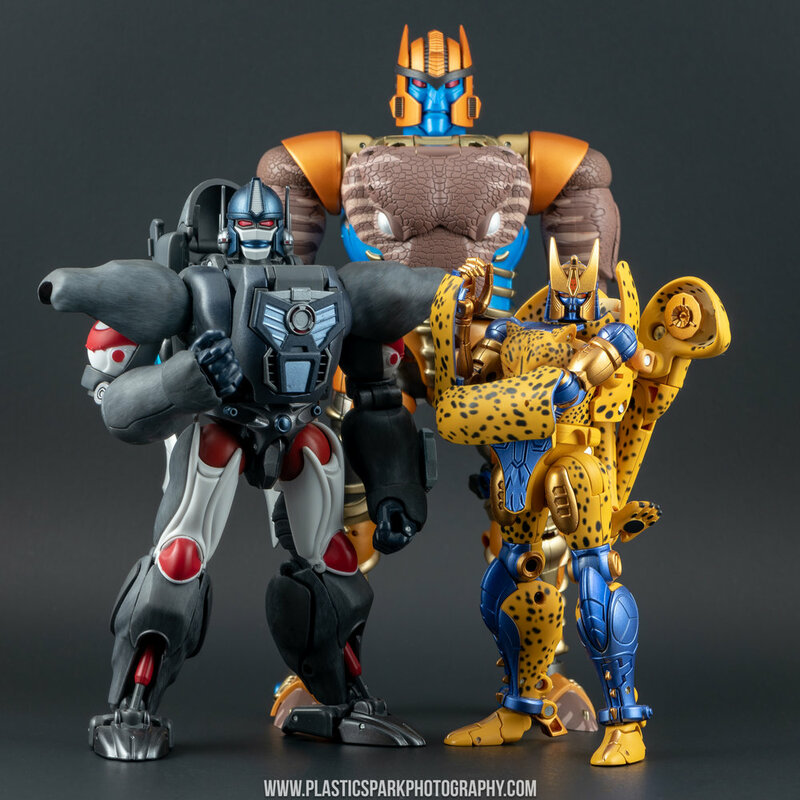 Days turned to weeks, weeks turned to months, Masterpiece Cheetor found a happy home in my collection alongside Primal, and finally the day I had been waiting for was upon us. The day I never dared to dream of. 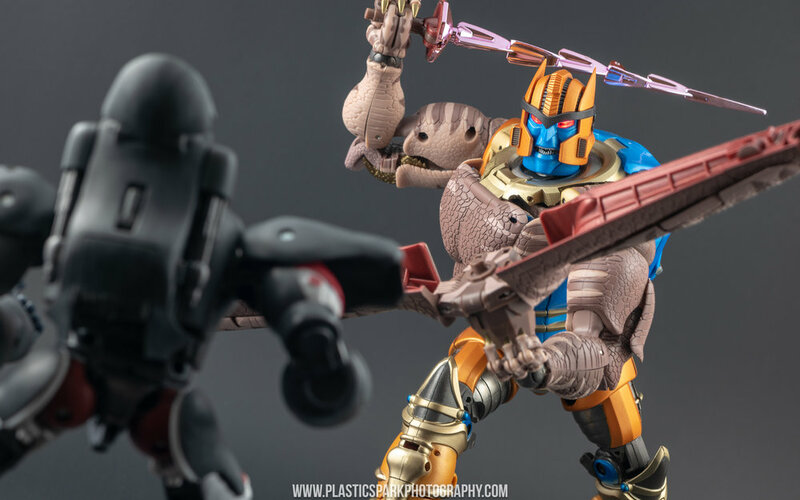 Prototype photos… of Masterpiece Dinobot! 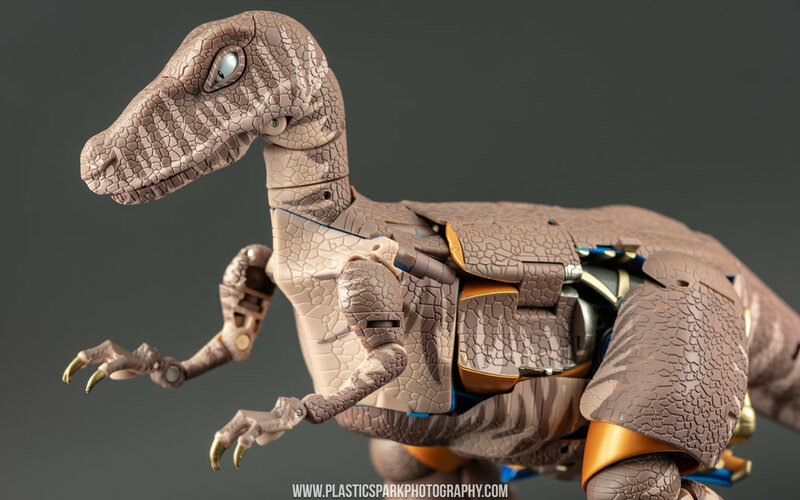 Show accurate Velociraptor alt mode! 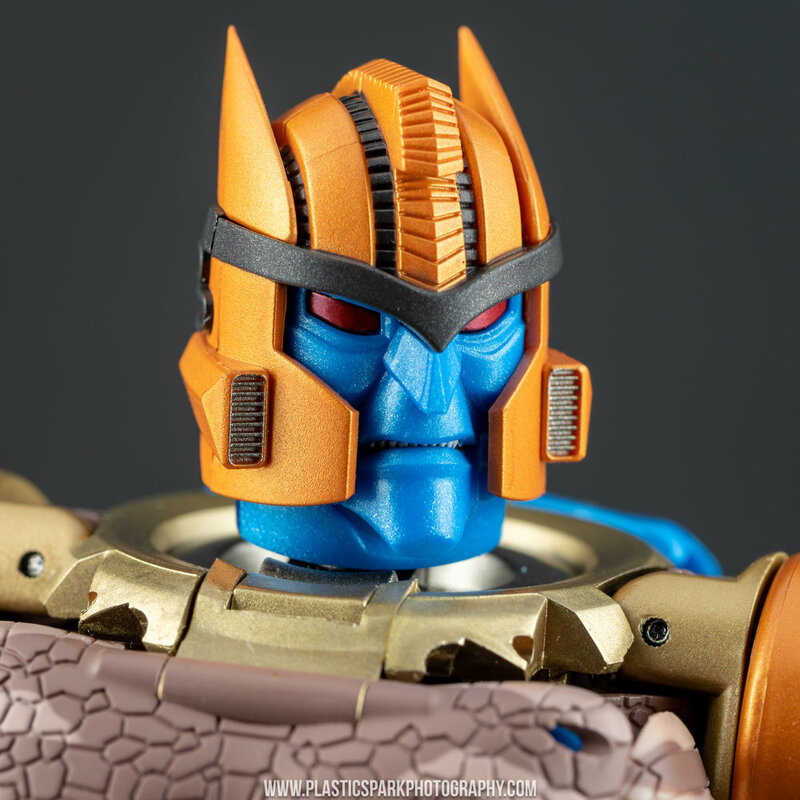 Swappable faces with functioning mouths! Laser Beam Eyes! Hot damn!!! 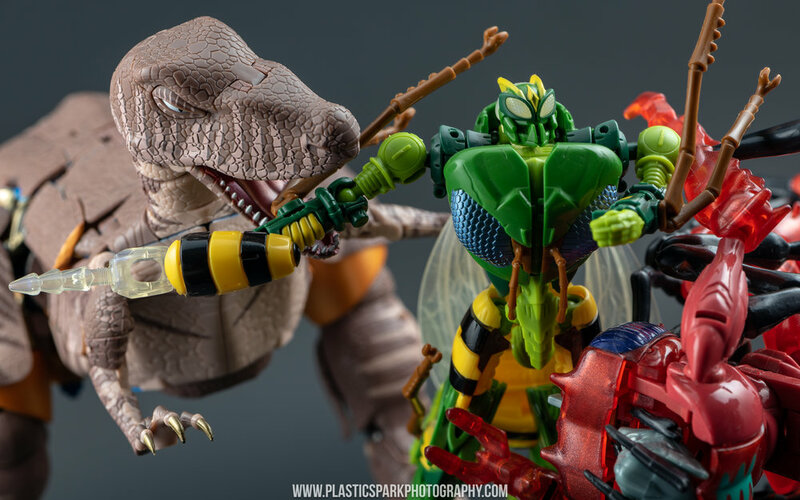 This is what I had been waiting for since I saw my first episode of Beast Wars in 1996! The realization of a dream 22 years in the making! Okay… admittedly I might be going a little bit crazy over a toy. I just wanted to set the scene properly and let you all know how long I’ve been anticipating this release, and how high of a standard I expect from it. Let’s get into the review proper and see how he turned out! Ok, let’s start off with realistic expectations here. 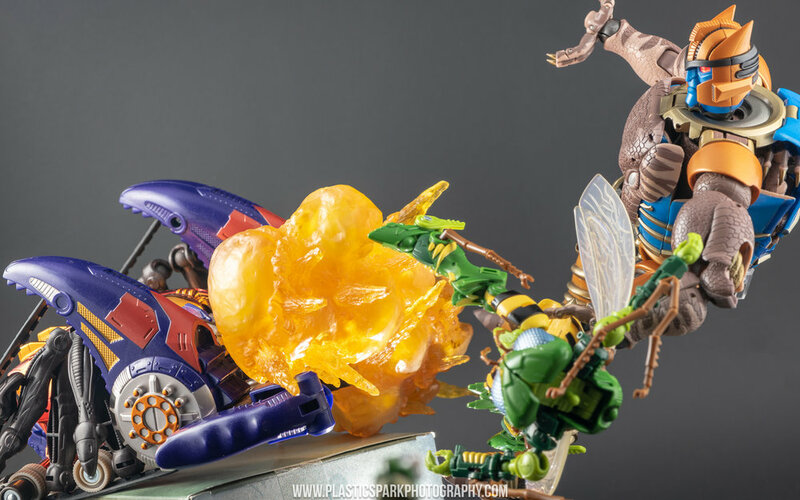 Takara’s engineering team may be wizards with otherworldly powers gained at a tremendous personal cost by trading portions of their souls to demons for each Masterpiece figure they design, but there are still limitations. 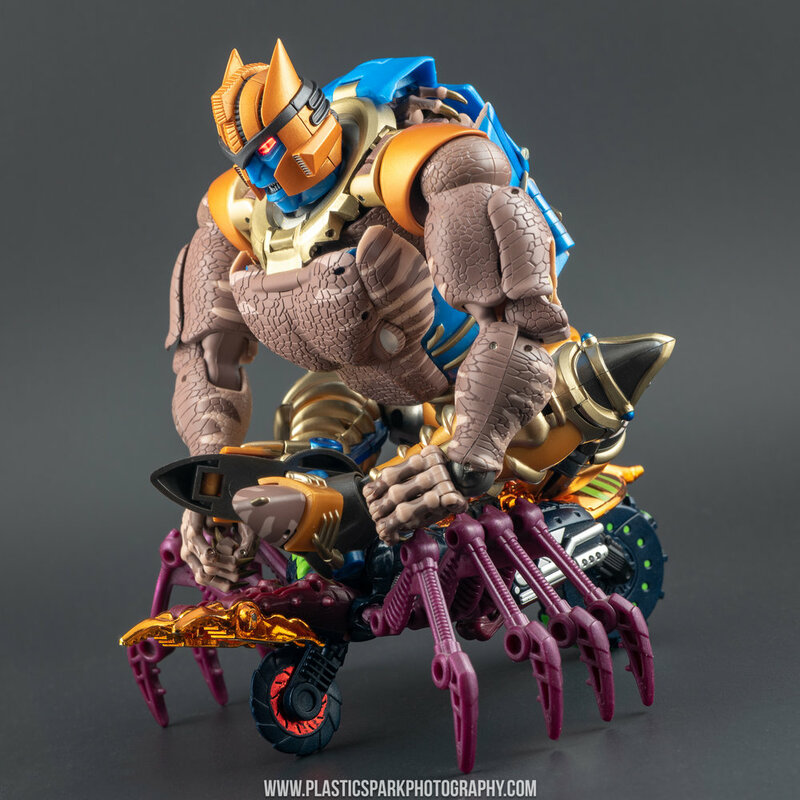 They are not going to be able to create a 100%, show accurate, fully transforming Beast Wars figure without a little bit of compromise. The realities of early CG animation used to create the show meant that there was a lot of cheating going on in the transformation sequences, with parts colliding, shrinking or growing, and in some cases being straight up replaced by new components that appear out of thin air. With this knowledge in mind, there are some obvious robot mode pieces that are visible right away in raptor mode. The folded up robot mode legs are the most obvious component sticking out from the bottom of the figure. I noticed them hanging there for about 2 minutes before completely overlooking them in lieu of how awesome and expressive Dinobot is. Surprisingly the rest of the robot mode is incredibly well-hidden with only a few splashes of bronze here and there. The raptor skin is rendered amazingly with sculpted polygonal scales arranged in random patterns. This does not emulate a more traditional lizard scale pattern so don’t stare at it too long if you’re a stickler for accuracy. I think they intended to match the rather chaotic looking CG model rather than a realistic interpretation of a reptilian scale pattern. It looks great and the fact that they went out of their way to actually sculpt the line work rather than paint it shows a remarkable level of craftsmanship. The two tone paintjob for his stripes is expertly applied and my particular copy is free of any major blemishes. The darker brown is paint, and in most spots the lighter brown appears to be the base plastic color. In particular if you look at where the tones meet it is a very soft blend and the dark brown paint is even applied cleanly within the grooves. I suspect this may be machine applied in a similar way to the digital textures on Cheetor and Primal. There is a tiny bit of blue that can be seen at the seams of the chest if you look closely, but not enough to worry about in my opinion. Dinobot’s eyes are painted in silver and black, with red and white paint applied to the gums and teeth of the raptor head. There is an eye swap gimmick similar to Masterpiece Grimlock, allowing you to switch between open, and squinting eyes in raptor mode. Finally Dinobot’s claws are painted in a dark brass color and are very sharp. Some screenshots show his claws being more of a bone color, and some match the brass used on the final product so it’s just a matter of preference from Takara I suppose. The claws on his feet feature a sort of porous texture carved into them. The paint all feels very resilient and I didn’t notice any chipping or scuffing during the few days I spent shooting him. Articulation in raptor mode is fairly robust allowing for a ton of expression even just in the upper torso and head. The raptor neck is comprised of 2 hinges plus a swivel at the base of the neck. He’s got an opening jaw, a tongue on a separate hinge, and the top set of teeth can be lowered to make it look as if he is snarling or baring his teeth aggressively (a feature which I almost didn’t find by the way!). 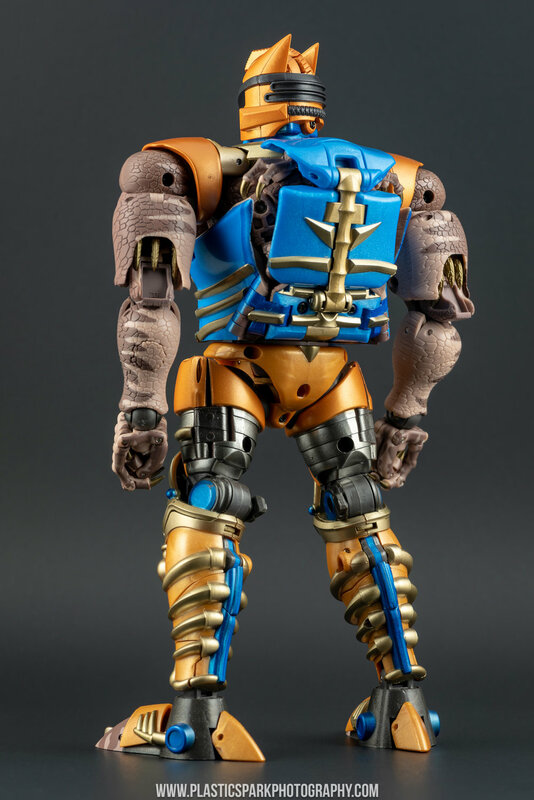 His arms are on ball joints connected to hinges at the base with a slight forward butterfly motion built in, a bicep swivel, single joint at the elbow, and a double joint at the wrist. Wrist swivel would have been nice but getting creative with the bicep and wrists will let you do pretty much whatever you like with his arms. There are even holes in the palms that allow him to hold his robot sword, or an adapter to hold the included Golden Disc. Dino legs are a bit of an interesting affair. They are locked at the hips. DO NOT ATTEMPT TO SWING THEM FORWARD OR BACKWARD AT THE HIPS! You will break a retention clip if you force it which may cause irreparable damaged to your expensive figure! You can unlock these clips to allow a front/back swing but there is very little tension in these joints as they were not intended to be load bearing. The locked hips prevent some more extreme poses but if you spend some time getting to know how all the joints in the legs work you can still pull off some pretty good stances. The functional articulation starts with a rotation at the top of the thigh, as well as ratcheted movement in one direction which can be altered by rotating the joint. A reversed knee with ratchet joints as well, and a simple hinge at the ankles. There is also a separate joint to allow for an ankle tilt in a wider stance. The hinge at the ankle is a bit weak and may have benefited from ratchet joints, surprisingly this is one of the only joints on the figure that doesn’t have ratchets. 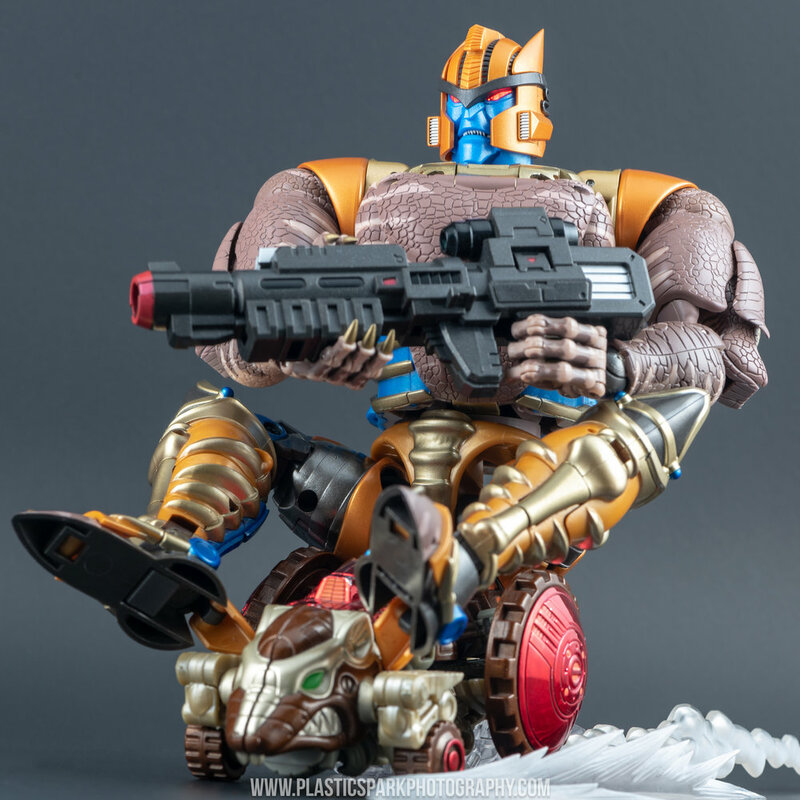 You need to get Dinobot’s balance just right, or use the included stand to support him. This is the only real annoyance I had in dinosaur mode. Lastly the tail can swing side to side, and curl up/down at 2 points. It’s easy to achieve a natural looking arch in the tail, but the side to side swing looks a bit boxy if you’re not careful. Overall the raptor mode is incredibly expressive and phenomenally accurate to the show model within the constraints of a transforming figure. I am very impressed with how he turned out. Ladies and gentlemen! Boys and girls! Vermin and arachnid alike! Gather around for a tale to amaze! A wholesale display of unimaginable magic! Witness as Dinobot practically turns inside out in an unbelievable transformation to hide the majority of his dino-mass within his chest and body and leaving behind a startlingly show accurate robot mode. This is what I pay the big bucks for. 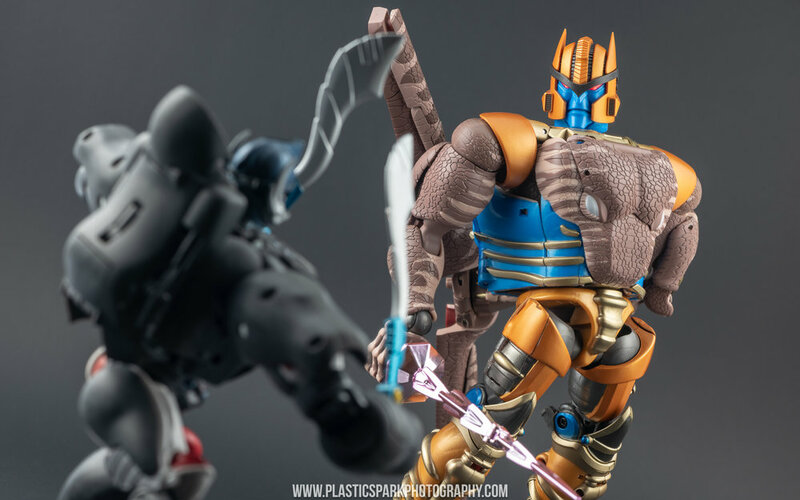 I know the price points keep going up and up and up, especially on the Beast Wars line, and believe me my wallet is not happy about it but the transformation engineering in the Masterpiece line is where Takara earns their keep. I have transformed Dinobot back and forth several times, it is an impeccable transformation that is easy to memorize despite seeming complex on the surface. Lining up the shoulders the first time was a bit tricky, and packing his dino arms into his backpack can be a chore, but after flipping him back and forth a couple times I have it down to a science. Tell my tale to those who ask it. Tell it truly, the good and the bad, and let me be judged accordingly. 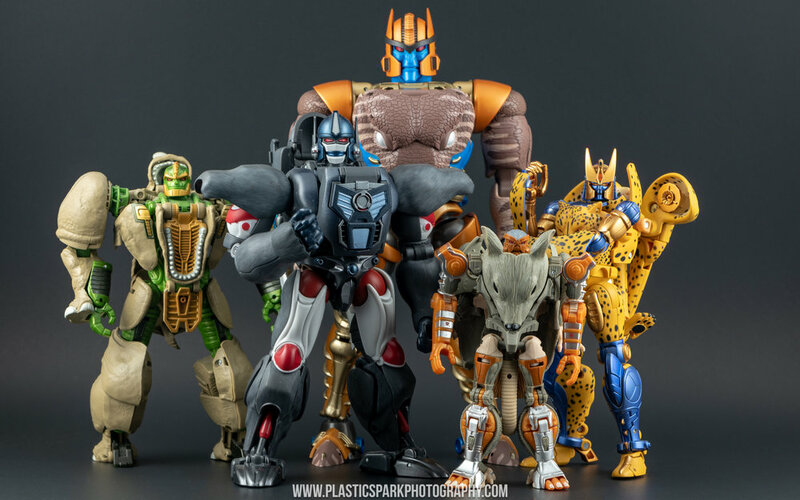 Dinobot is massive compared to the other Beast Wars releases. Standing just under MP-10 in height but with a surprising weight and girth to him that make him feel much larger than he really is. 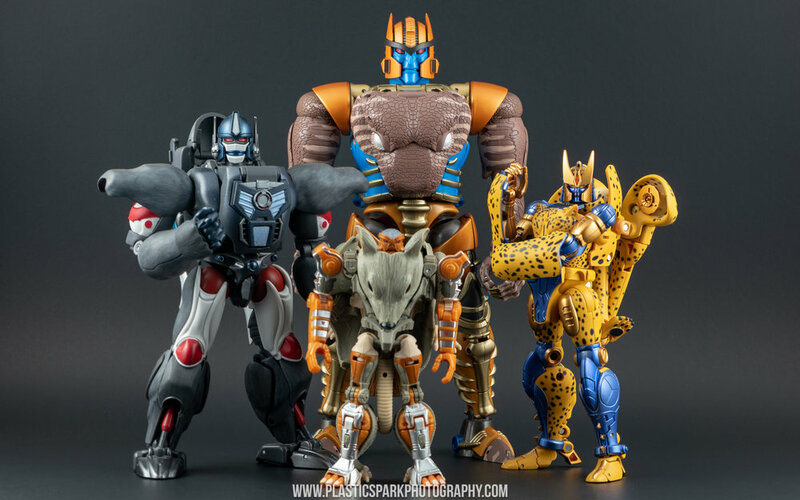 He towers over Masterpiece Optimus Primal and Cheetor in perfect scale to the on-screen appearance of the Maximals. I’ve seen a few people say that he looks too large in comparison, I even felt similarly in some early production photos, but in hand and compared to the show which I’ve been re-watching, the size is just right. 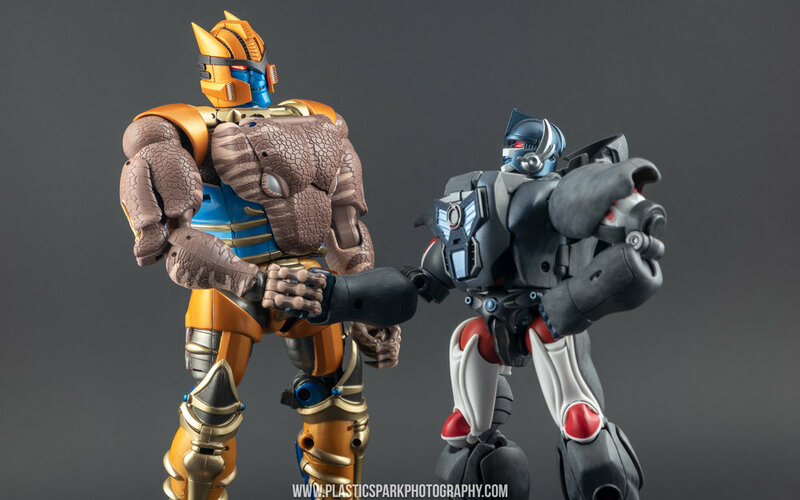 Scale can be a tricky thing when it comes to Transformers, but Beast Wars tried to keep it fairly faithful throughout and I think Takara made the right choice regarding Dinobot’s physical size. 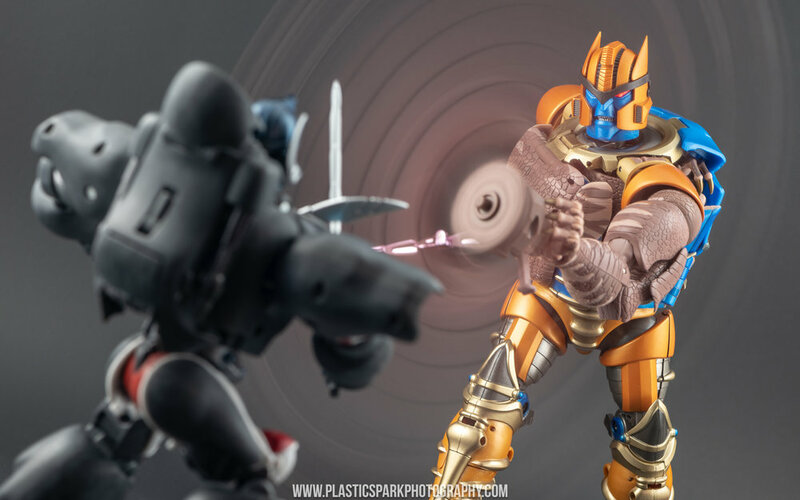 Well that's just Prime...with Cheetor and Dinobot. 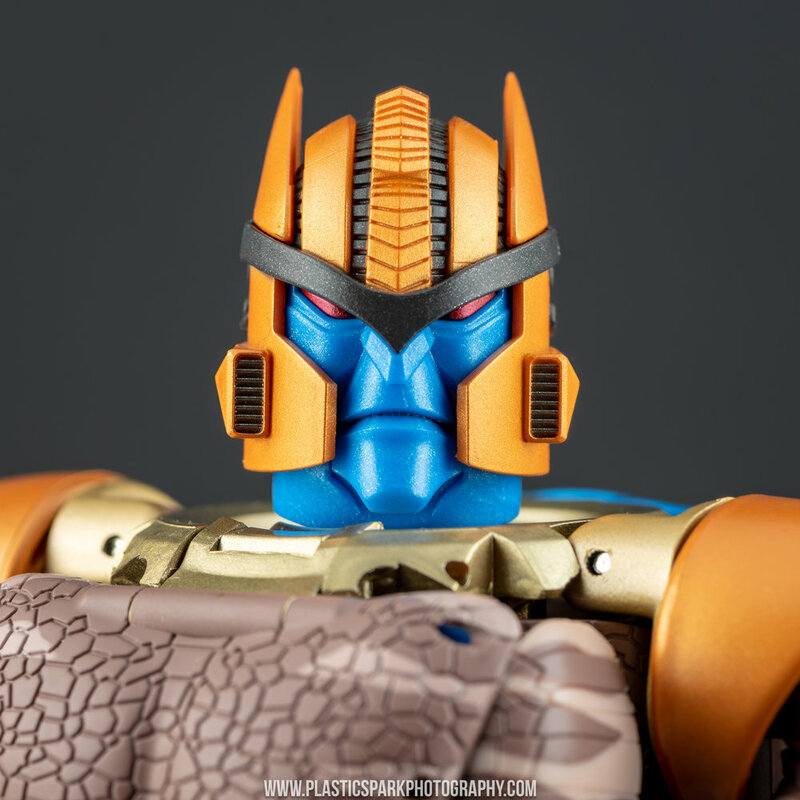 Dinobot’s transformation reveals an entirely new color pallet of bright blue, copper, and gold. If it wasn’t for the flattened dino head chest plate and his scale covered arms and claws you’d never know this robot turned into a vicious velociraptor. He looks like an action figure, with every spare bit hidden within the center mass of his body. There is no exposed kibble anywhere. You can see the dino hands if you look inside the backpack but nothing is hanging off or obviously visible unless you know where to look. On the topic of the head chest, I found it quite clever that it is actually a functional part of the transformation; becoming the raptors stomach. It’s still a false piece but it has an actual function unlike the false chest on Cheetor and I think Takara deserves some bonus points for actually integrating it in a practical way within the limitations of the character design. 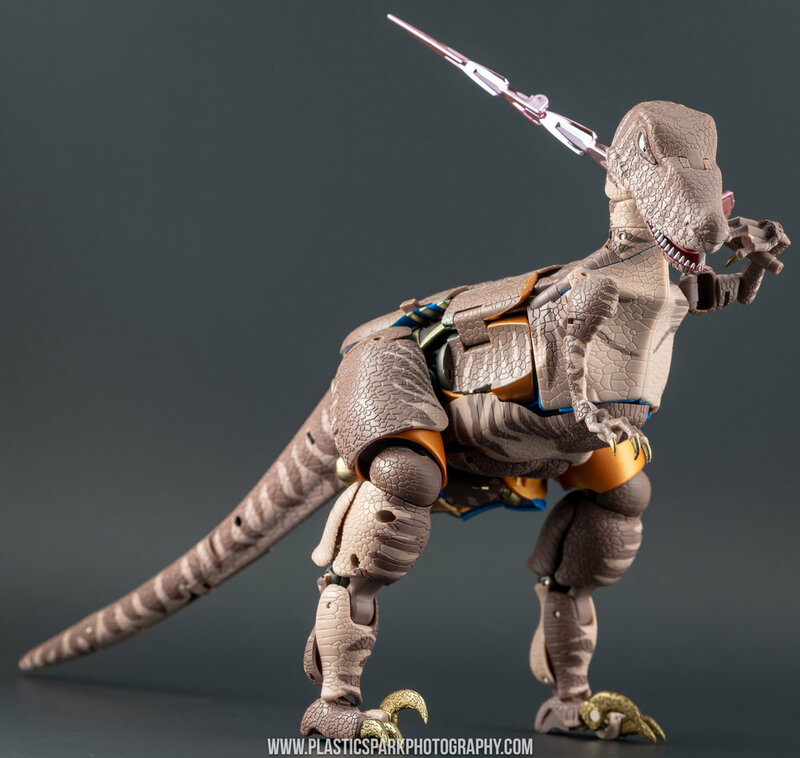 Dinobot’s gorgeous form is matched in function with an impressive suite of articulation. From the top down he has a ball jointed head, allowing for a full 360 degree rotation, tilt up/down and side to side, as well as a hinge from transformation that can be utilized to help him look down. This will break the sculpt but can be utilized for shots from low angles where the break won’t be seen. The mouth on each faceplate is also on a hinge to open and close allowing for an incredible range of expression. His shoulders are on ratchets to swing outwards to 180º and forward/backwards 360º. There is a second ratchet at the base of the shoulder armor that can be utilized for even more range but does look awkward if pushed too far. It’s a great set of joints for overhand sword stances or plunging strikes. There is a bicep swivel at the top of the arm, a single jointed elbow with a heavy ratchet that allows for a couple clicks past 90º. The raptor claws will start to come out of the back of the upper arm if the joint is pushed too far. Wrists have a full 360º rotation as well as a ratchet joint to allow for a tilt up and down or side to side depending on the orientation. This gives him the ability to pull off a nice sword pointing stance which I always appreciate. Finally the claws are on hinges at the base, and at the mid knuckle. 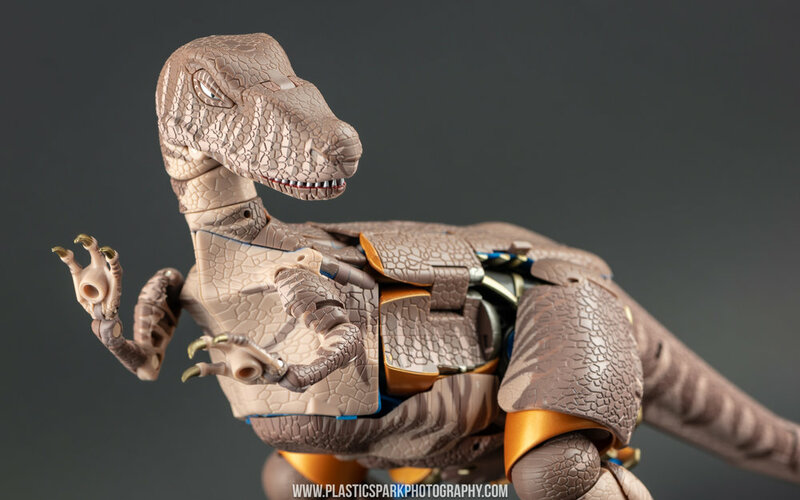 The 3 larger claws are independently articulated adding to Dinobot’s expressiveness. Dinobot’s waist is on a swivel joint allowing for 360º rotation. There is also an ab crunch that can be utilized for certain poses. I actually missed the ab crunch in my first session with the figure as it’s not immediately obvious due to how it is hidden in the torso. The ab joint on my copy doesn’t have a lot of tension. I think it could have done well with a couple ratchet clicks as it is not always functional depending on the pose you’re trying to achieve. Hips are on ratchets forward and backward, as well as out to the side. There’s a thigh swivel at the top of the thigh that is necessary when trying to achieve wider stances as Dinobot’s thigh armor will hit his waist if not adjusted. He’s also got a swivel above the knee for transformation that can be utilized if needed. Very tight ratchets at the knee, bending well past 90º to allow for proper kneeling poses. Just be careful to keep his legs aligned as there is a tab on the back of the knee that fits into a gap in the thigh. The ankles have a rotation, some tilt back to front, and a fairly competent inward rocker. Just like in dino mode, there are no ratchets in the ankles and with how top heavy ol’ Chopperface is I think Takara would have done well with including them. This can make balancing Dinobot very tricky sometimes and I will likely have to tighten these joints in the future. The addition of the stand assuages some of my concerns as long as you have the shelf space to display it. 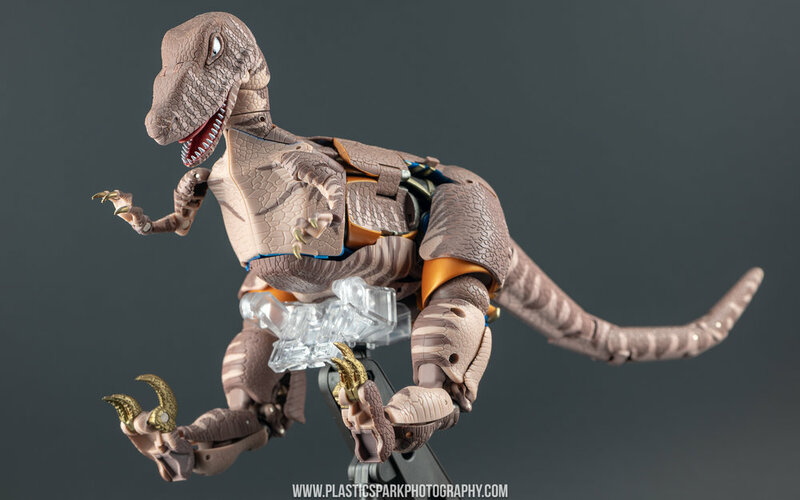 Dinobot comes with a modest cache of accessories to compliment both his robot and raptor modes. "What's a warrior without his weapons?" 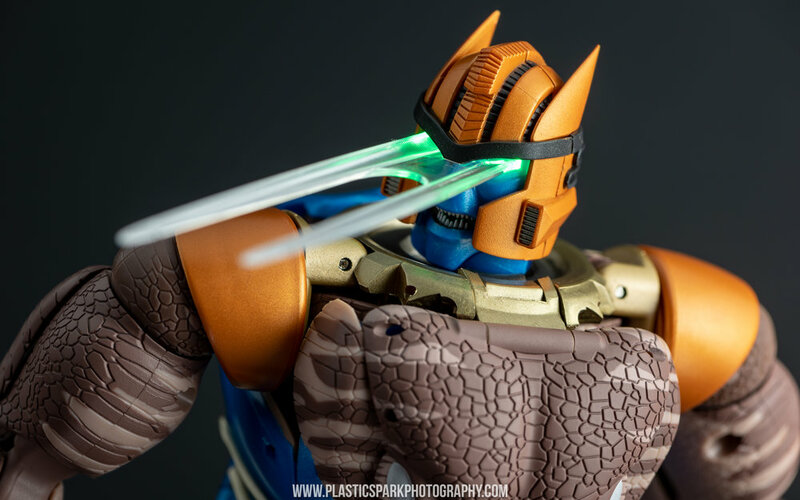 1x Sword – Dinobot’s trademark weapon. The chromed sword has pegs to allow it to be held in Dinobot’s hand vertically or horizontally. The sword can also be mounted in the center of the shield while deployed, and folded for storage within the raptor tail. The sword has a chrome finish with an almost pink hue. While I personally envision the sword as a more brilliant silver chrome I have seen some screenshots to justify the chosen color. There are a couple of notches of exposed plastic on my sword, from where it was cut off the sprue. Clearly the sword was chromed while attached to the sprue and then cut off. This is a bit disappointing especially on such an expensive piece. 1x Cyber Shield – Formed from the raptor mode tail split down the middle. There is a flip out plunger that can be used to unlock the spinning gimmick, and pressing in the plunger will cause a gear to spin the tail. I like that the spinning feature is able to be locked via folding away the plunger piece. Personally for the asking price and “collector” target audience, I would have preferred to see some kind of wind up gear or even a battery operated feature as the plunger system feels incredibly cheap and makes it a bit difficult to photograph while in motion. 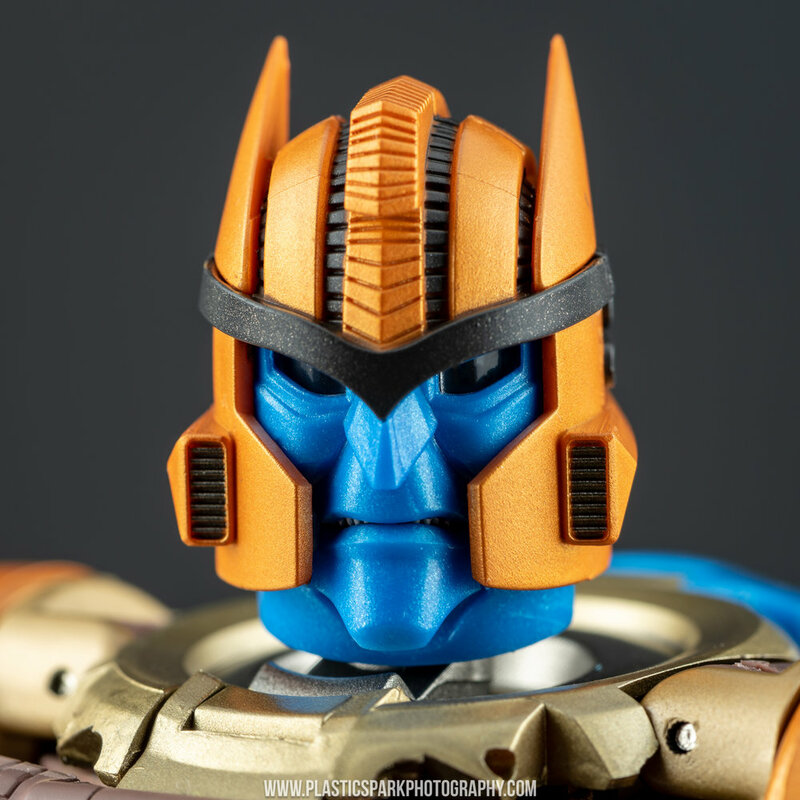 4x Faceplates – There are 4 included faceplates for Dinobot, each depicting a different range of emotion. 1. The default scowl with squinting eyes, this is the faceplate equipped out of the box. 2. A smiling face that ranges from a confident smirk to a wicked maniacal grin and everything in between by adjusting the lower jaw. 4. A variant of the snarling face with unpainted eyes. This faceplate is designed to work with a Laser Eye effect that is included. 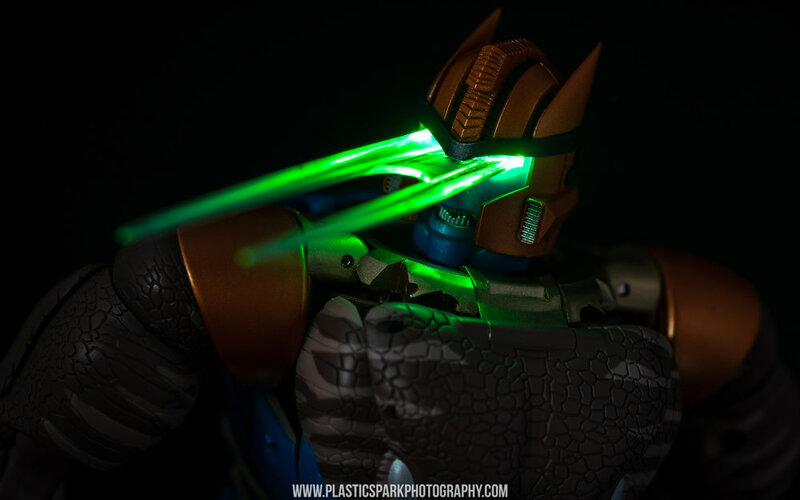 Simple press the effect piece into the eyes of Dinobot and press the LED switch to light up the eyes and the effect piece. Press the button once for red LEDs, long press it again to turn the eye effect green. This is an incredibly effective piece and I’m absolutely in love with how it turned out. Some translucent green on the effect piece would have maybe helped sell the look a bit better. "Destiny has one great test in store for us all. Has mine already come? And have I failed it?" 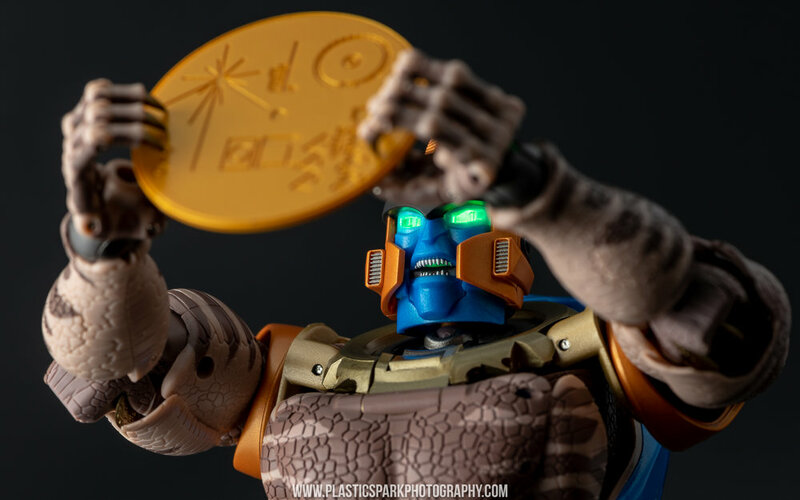 1x Golden Disk + Adapter – A replica of one of the two Golden Disks, Maximal relics stolen by Megatron before crash landing on Earth. (Spoiler Alert!) The disks themselves are actually the Voyager Golden Records that were sent into space aboard the Voyager space probes launched from earth in 1977, containing information about earth and humanity. The disk has various symbols etched into the front, and on the rear has the engraving “The sounds of earth”. These disks are central plot devices of the Beast Wars series and change hands a few times before the shows conclusion. "A deed once done cannot be undone, but perhaps, it may yet be mitigated." The disk itself is well rendered though I think a chrome finish would have been more impressive and show accurate. 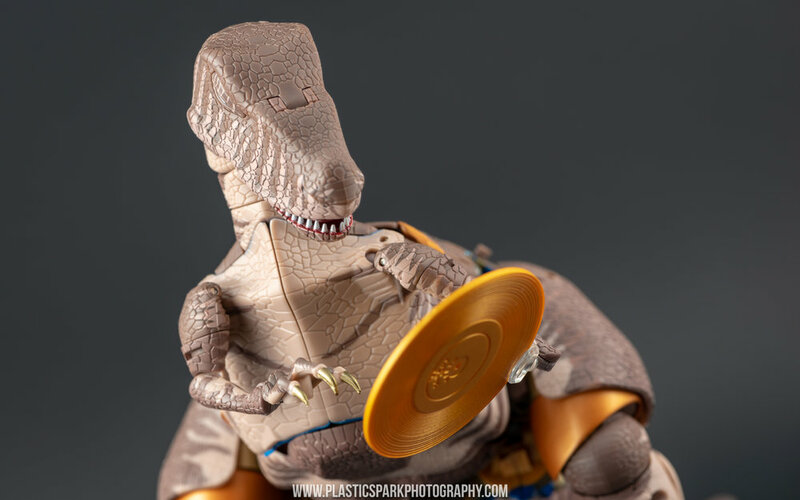 A clear plastic adapter is included to assist Dinobot in holding the disk in either mode. There is also an included clear plastic easel style stand for the Golden Disk. 1x Adjustable Stand – This 5 piece stand is an awesome included bonus. At first glance the stand itself seems fairly basic but once assembled it has proven to be a very powerful tool for displaying Dinobot in either mode. The assembly is simple and using the stand is incredibly intuitive and satisfying. There are cradles for both the robot mode and beast mode and the head of the stand is adjustable in 4 directions. The cradle for Dinobot in raptor mode can be locked in by folding open his stomach panel and then folding it closed around the cradle. I didn’t realize this until I was finished with my photos so I have him just balanced on the cradle in my shots. I really don’t think I could be any happier with how Dinobot turned out. His robot mode is incredibly faithful to the CG model used in the TV show. There’s next to no visible kibble at all in bot mode. His articulation is above and beyond most of the Masterpiece figures previously released in both the Beast Wars and the G1 Masterpiece lines. This is truly a marvel of engineering from Takara. "That's not how we Maximals do things." This is the finale of a dream over 20 years in the making and I couldn’t be happier. 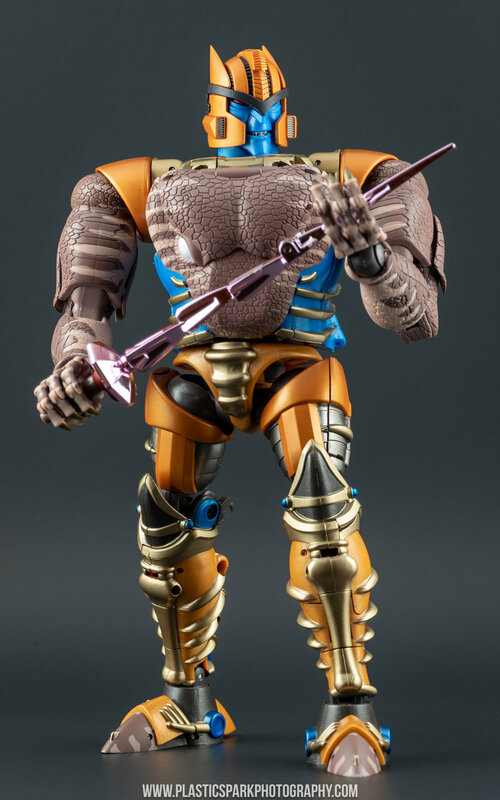 If you are a Beast Wars fan, a fan of the Dinobot character, or even just a Transformers Masterpiece collector you need this figure in your collection. "...Then that...hnngrrr... Shall have to CHANGE!" The general concern about this figure that I see within the community is in regards to the price. It’s a high asking price, no doubt about that. I do not begrudge anyone for skipping on this figure due to price point. I feel like I got my money’s worth and maybe even more but every collector is different and we’ve all got different priorities. Perhaps if I had been unlucky and gotten one with poor QC, or the shoulder issue that some people seem to have had, I would feel differently but with a damn near perfect Masterpiece Dinobot in my hands I truly could not be happier with the experience. 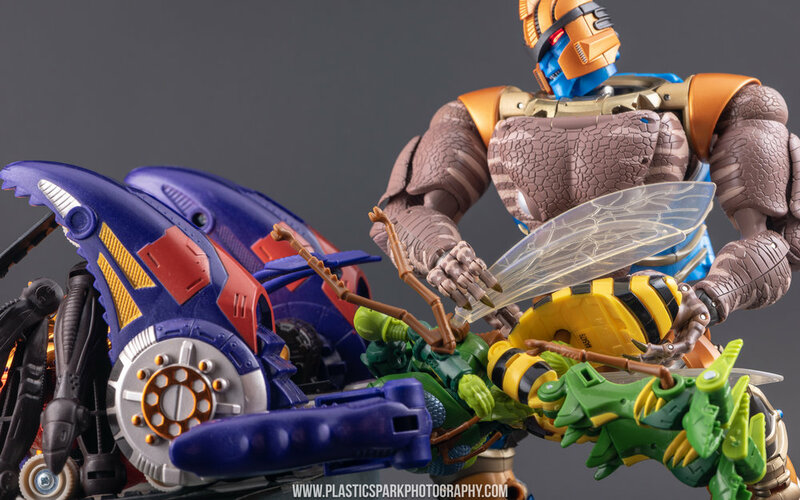 Bring on more Masterpiece Beast Wars!